Fire and Forget: Short Stories from the Long War is an anthology of short stories about life at war and after, mostly set in Iraq and Afghanistan or back in the U.S., written by veterans and at least one military wife. I didn't take notes on the stories in this one, unfortunately, so I'll just flip through the book and tell you a little about a few I remember enjoying. "Tips for a Smooth Transition" by Siobhan Fallon - Excerpts from a guide on how to deal with a returning soldier are inserted within the story of Evie, whose husband is returning from Afghanistan. Thoughtful and sometimes chilling, "Tips for a Smooth Transition" sets you firmly in the shoes of a military wife whose spouse may have returned a different person. When he starts tossing and turning in his sleep, she jumps up and puts her hand on the doorknob in case he might have trouble distinguishing a nightmare from reality and become violent. "Play the Game" by Colby Buzzell - An infantry soldier decides not to "re-up" but then he's at loose ends. He has no idea what kind of job to get and finds himself a room in a cheap hotel. He can't sleep and might be having hallucinations. When his car goes missing and he files a report with the police, he's convinced it was stolen. But, then he happens across his car and a memory returns to him. A story that makes you understand how isolating it can be for someone to leave the military and how difficult to figure out that next step in life. At one point, the protagonist gets a phone call and you're also left wondering if he's got some sort of medical issue that's the underlying reason he's self-medicating with alcohol. "When Engaging Targets, Remember" by Gavin Ford Kovite - An infantryman in charge of a machine gun to protect a convoy traveling from Baghdad airport to a Forward Operating Base goes over the rules of engagement. When a car begins to rapidly approach the convoy, he must follow the rules to shout a verbal warning, display his weapon, shoot a warning shot, then a disabling shot, and finally shoot to eliminate the target, if necessary. But, how do you decide whether or not the vehicle is a genuine threat? What if the people in the car simply need to get by? This is the decision the protagonist is faced with. "Roll Call" by David Abrams - After the memorial service for one of their friends, a group of soldiers stands around on the Forward Operating Base, remembering the many people they know who have fallen. The sheer quantity of people listed and the horrible ways some of them died (they don't go into detail about every death) will make your toes curl. Interestingly, both of those books happen to be books that I've thought about a lot, since reading them. I passed on my copy of You Know When the Men Are Gone and then almost immediately regretted it. I ended up getting an electronic copy, but I may just eventually buy a new copy of the book since I'm terrible about reading e-books. Brave Deeds has stuck with me in the same way. I can remember some of the scenes that moved me the most and the incredibly moving ending of Brave Deeds. Both had a powerful impact on me. Highly recommended - A difficult read that gives the reader a variety of perspectives of military service and its challenges, especially the transition from war zone to civilian life. 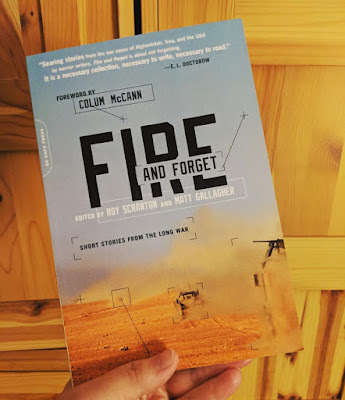 I had particular favorites but Fire and Forget is an unusual collection in that I didn't actively dislike any of the stories. A couple of them are actually humorous, which gives it a nice balance because most hit you pretty hard with a good dose of painful reality. As I flipped through Fire and Forget, just now, I found myself getting sucked into every single story and wanting to read it all over again. A solid collection of stories that I will definitely save for rereading.